If you’re on the hunt for a small but powerful sporty sedan, there’s nothing quite like the BMW 4 Series. Luxury, comfort, and athleticism are all executed perfectly in this car, making it a perfect choice for commuters in Westchester County, White Plains, and New Rochelle. 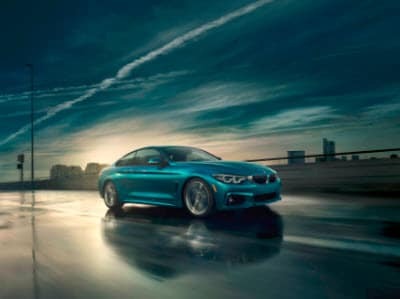 To help you determine if this car could be a good fit for your needs, our team at BMW of Westchester has put together this 2018 BMW 4 Series review. Let’s explore what’s under the hood and inside the cabin! The 4 Series boasts athletic handling, with a well-balanced feel and a smooth ride even over imperfections in the pavement. There’s three different engines available in the car, so you can choose the power that you want. You can choose between an 8-speed automatic transmission and a 6-speed manual. The base model of the car gets a standard 2.0L 4-cylinder engine that makes 248 horsepower. This engine achieves an EPA-estimated 24 city/34 highway MPG, which is good for the class. In the next trim, you’ll upgrade to the 3.0L turbocharged V6, which makes 320 horsepower and gets an EPA-estimated 21 city/32 highway MPG. Finally, the high performance M4 comes with a 3.0L twin turbocharged V6 that produces 425 horsepower, or you can add a performance package to raise this to 444. 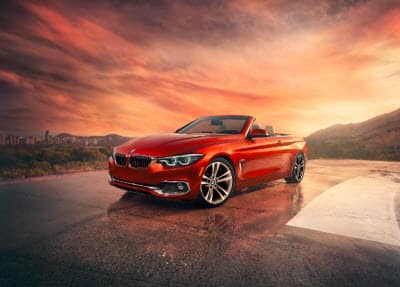 The 4 Series is available in several body styles, including a coupe, convertible, and Gran Coupe. The coupe and convertible seat four, while the Gran Coupe seats five. All options come standard with leatherette upholstery and power adjustable front sport seats. Other options include genuine leather upholstery, heated front seats, and a heated steering wheel. In terms of cargo capacity, the convertible model offers 13.1 ft3 of space in the trunk. The coupe brings you up to 15.7 ft3, and the Gran Coupe has a spacious 17 ft3 of cargo capacity, which is very high for the class. The Gran Coupe also comes with a standard power trunk lid, and is large enough to serve as a family car. Inside the vehicle, you’ll find a 6.5-inch display screen to power the iDrive infotainment system. Connect to the system using Bluetooth® or a USB port, and enjoy crisp, clear sound from the 9-speaker audio system with HD Radio™. You’ll also enjoy a standard moonroof and dual-zone automatic climate control. A rearview camera is standard for safe parking and reversing. There’s plenty of additional options available for those who want more, including a 16-speaker stereo system, Apple CarPlay™, a built-in Wi-Fi Hotspot, a variety of driver assisting safety systems, and more. If you like the sound of this car’s impressive drive qualities and modern technology features, you’ll want to come see it in person. Contact BMW of Westchester to schedule a test drive, so you can get behind the wheel for yourself. Get ready to hit the streets of Westchester County, White Plains, and New Rochelle; fill out the form below and take a test drive today!